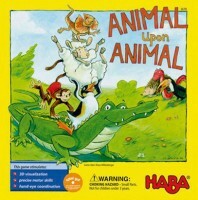 Crocodiles, frilled lizards, sheep, toucans and monkeys, hedgehogs and snakes... you’ll never find such a motley mix of animals in any other game, and it’s celebrating its 10th anniversary: Animal Upon Animal from HABA! The entertaining stacking game was first released in 2005 and has since sold over 600,000 copies! One of HABA's most popular games, this game is a winner of the Major Fun! Award and recipient of the Mr. Dad Seal of Approval. 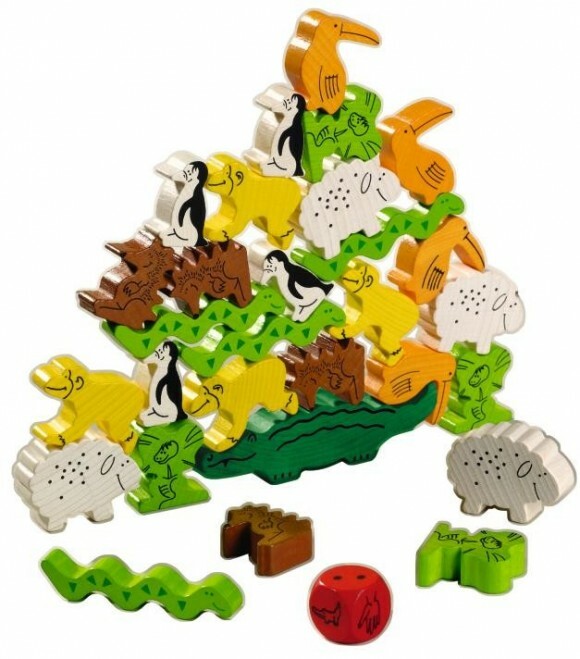 Players race each other to be the first to place all of their wooden animals upon the animal pile before any of the other players. A roll of the die tells the players how many animals can be placed or whether they can add to the alligator base. This game fosters hand-eye coordination and fine motor skills. Add a Review for "Animal Upon Animal"